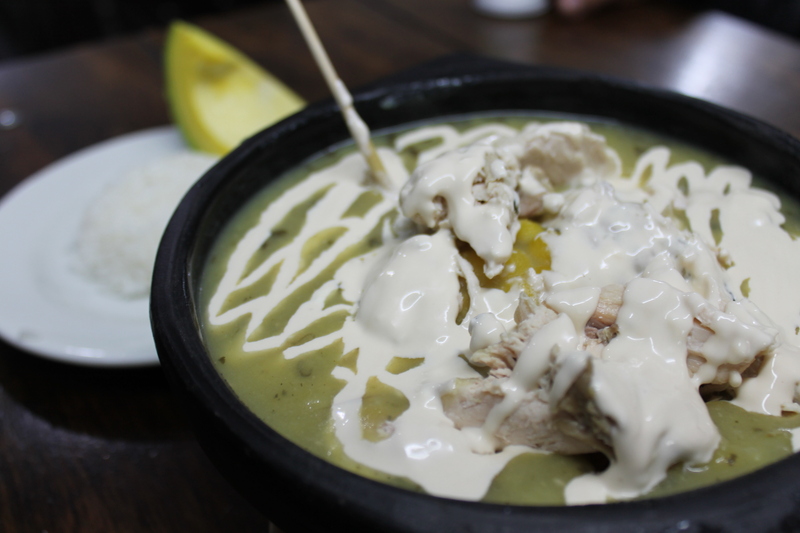 Ajiaco, soup with chicken breast, guasco, rice, corn, and avocado. Every place has it’s national dishes. Here in Colombia, if you ask, they’ll probably mention the two most famous soups: sancocho and ajiaco. Or the empanadas and arepas. I really like ajiaco because it’s got cream on it and you can add your own rice and avocado (like bacon, avocado makes everything better). The distinctive taste and color of ajiaco is a herb called “guasca” which is translated into English to “gallant soldier” but I’ve never heard anyone call it that. It also has medicinal uses. There are many types of corn in the world. The cob in my soup was different than in the corn in the U.S. The corn that most of the world, outside from the birthplace of corn — the central Americas, eats is the small and sweet variety. This corn was starchier and each kernel was much larger (choclo, like what I’ve had in Peruvian restaurants). The way to eat the cob in the soup is to take the handy skewer, turn the cob, and spear the skewer into the end of the corn. Then it’s easy to bite the kernels off the cob. I’ll write more about the restaurant where I had the ajiaco another time. Freshly deep fried empanada and salsa. Every country has a dumpling of some sort, sometimes boiled, steamed, or fried. 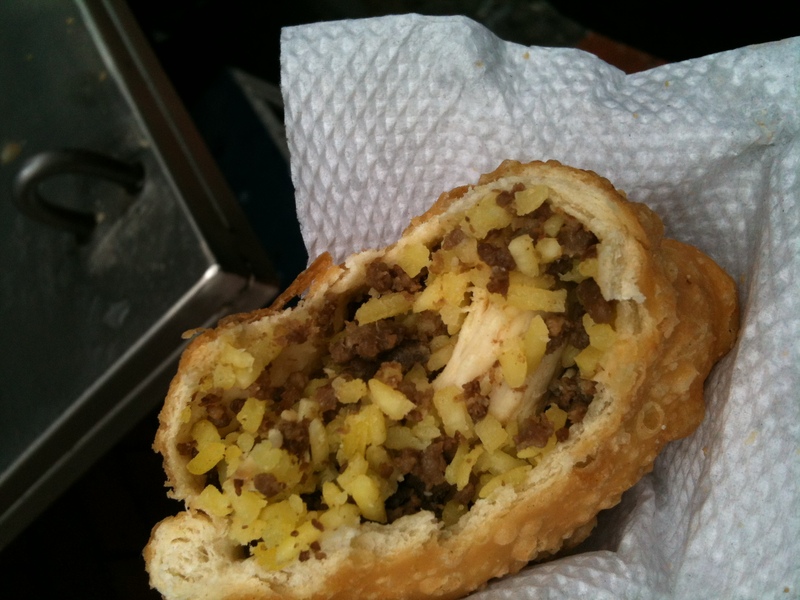 The other day, I had a delicious fried Bogotano empanada. The sauce was surprisingly spicy. Everyone told me that Colombians don’t like spicy food. That may be, but this salsa did not take prisoners. Wowza. 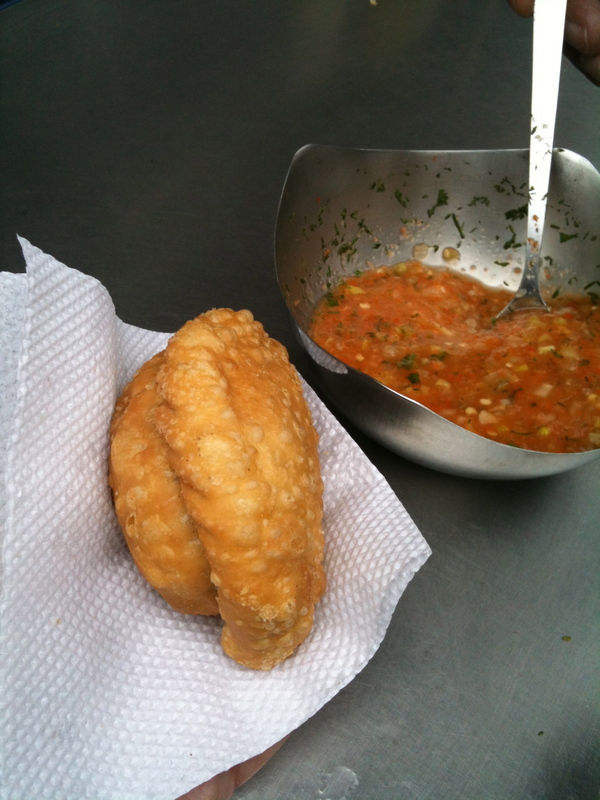 Eating these empanadas from a street stall reminded me of the fuchka of Bangladesh. Inside is rice, beef, and chicken. As for the arepa. This one was made of white corn, griddled and brushed with butter. Inside was a center of melted cheese. I didn’t actually like this very much as it had a slightly soured yogurt-like tang to it which I didn’t find all that appealing although I love that flavor in dairy products (more about dairy another time). I’ve had arepas before which were spliced and stuffed like sandwiches but this one was more like a pupusa. Will have to try others along the way. 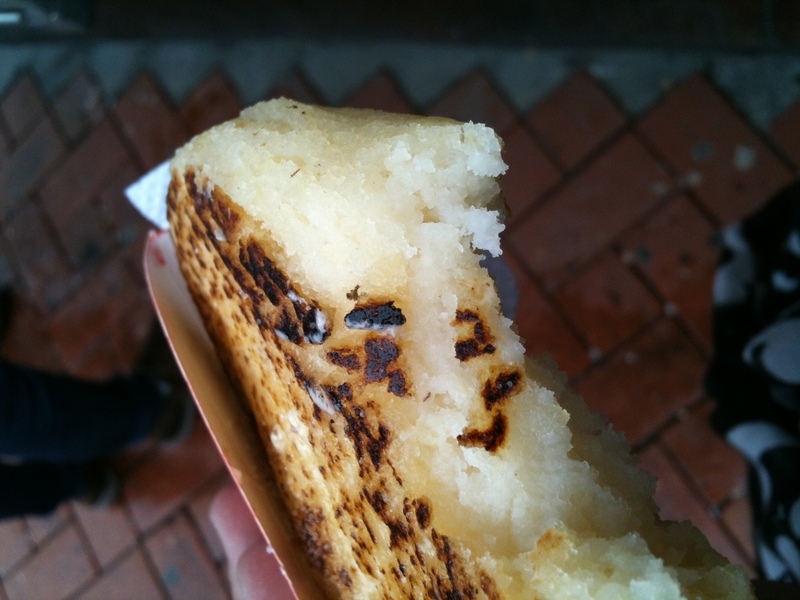 Arepa, straight up with melted butter. Not sure, but I think that bigger corn is the same thing as hominy in the States, which is what they use to make pozole in Mexico, if I’m not mistaken. Hominy, regularly eaten in the past as hominy grits, might be something only Southerners used to eat (I should know that, but can’t say 100%). Sure is! Thanks for the reminder. I tried to order a pozole the other day here and the waiter told me that it was too big to eat as a “side soup” so I didn’t get it. But, the corn is great. Much starchier than sweet corn.